Meet Kala Katiwada, a 47-year-old woman living in Kalleri village in Dhading, a district less than 40 miles from the epicenter of the first earthquake that struck Nepal on April 25th. Kala and her extended family of six each live on less than $1 U.S. a day, from income earned by farming the steep, terraced fields around their home. Kala's husband, Ram Hari Katiwada, is seriously ill and cannot work. Just 13 days before the first earthquake, Kala had finished a weeklong training workshop to start her own business bringing solar light and mobile chargers to her rural community. She had just become the sixteenth clean energy entrepreneur to join a women-led solar distribution network in Nepal run by the social enterprise, Empower Generation. Kala knew communities like hers -- those heavily reliant on toxic, expensive and inefficient light sources like kerosene, torches and candles -- would benefit tremendously from access to solar products. She had no idea, however, just how important these lights would become in the aftermath of the devastating earthquakes. When the first earthquake hit Nepal, Kala was working in the fields. The rest of her family was at home. Luckily they all managed to escape unharmed, but their entire village was destroyed, with many casualties and hardly any homes left standing. The army came a few days later to collect bodies and then they were gone, leaving the community wondering when help would arrive. Being a resourceful entrepreneur, Kala knew she had to take charge rather than wait around for aid that might never come. 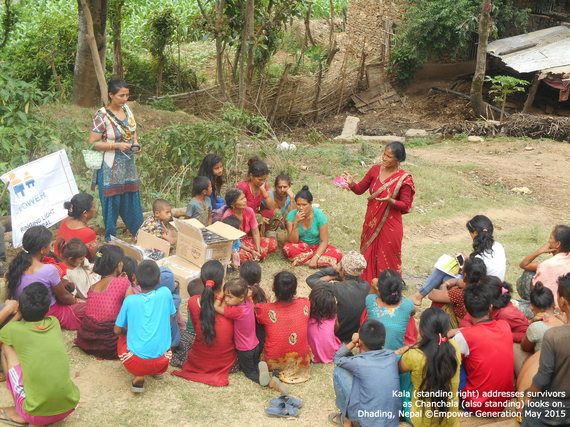 She had a connection -- Chanchala Dhakal from Empower Generation and, as aftershocks swept the country day and night, both women understood the importance of to bringing reliable light to displaced survivors. Together Kala and Chanchala made a plan to mobilize their network's resources on the ground to provide immediate help. Chanchala soon arrived in Kala's village with 2,000 solar lights and mobile phone chargers from the network's existing stock, as well as other donated goods from communities where sister entrepreneurs live. This was the first aid of any kind to reach Kala's community, as they were yet to receive support from government or international relief agencies. It was at this moment Kala led her village to make a critical decision about the much-needed supplies. While the situation in Kala's village was undeniably dire, there was another village of extremely impoverished people, known in the caste system as Dalits ("untouchables") that was in even more desperate need. Kala and her fellow villagers decided to embark on a four-hour hike, bringing supplies intended for them and their families to their less fortunate neighbors. Reflecting on this moment Kala says, "The most important thing for me is to able to distribute the lights to the people equally. This gratifies me to the fullest. Meanwhile, we have to reach out to many more people who still haven't received the power of solar." Despite having lost her home, sleeping in a tent, in a community without access to clean water, electricity or food markets, Kala is working tirelessly to seize the opportunity to build her fledgling energy business while helping to rebuild her country. By distributing clean energy, a valuable resource to survivors, she is establishing a local market for her products, recruiting sales agents from villages across Dhading and neighboring districts, and introducing herself as an unstoppable force of change. With unfailing optimism she says, "This devastating earthquake came as an enormous hurdle, but I can't complain, as it has given me an opportunity to take up the challenge of testing my own capabilities of providing service to the people in my community by all possible means." Chanchala Dhakal, a Program Coordinator, lives in Kathmandu. When the earthquake happened she remembers she was in her living room laughing with her husband and two teenage children. Suddenly the floor began to sway, and they ran to their balcony just as two bookcases crashed down where they had been sitting. The next day Chanchala bravely navigated rubble, gaping roads, and aftershocks, to help set up a solar powered charging station for relief workers at her office in Lazimpat. Joined by two colleagues and her children, Chanchala visited temporary hospitals and emerging tent cities, distributing solar lights she had managed to retrieve. Chanchala describes the earthquake and its aftermath in harrowing detail, and admits she still feels scared. However, in the face of these terrifying events her selfless instinct has been not only to protect her family, but also to help as many of her fellow Nepalis as she can. Since the first earthquake, Chanchala has travelled to Kavre, Nuwakot, Dhading (Kala's district), and Gorkha, helping distribute solar lights and mobile chargers that have helped around 50,000 people. "People love the lights. They are very necessary. At night it can be dangerous and light also helps keep thieves away. Solar light is the only light safe enough for people living in tents, as candles are unsafe because of fire danger. It is very hard for these people because their homes are gone, or they need to be demolished because they are too unsafe to live in." Chanchala describes that families in the tents gather around their solar lights. She says people are leaving Kathmandu and returning to their home villages, or anywhere they can help. In a way, she believes this is a chance for the people of Nepal to reflect and prioritize what is really important. It is also a chance for the world to reflect; to recognize women like Kala and Chanchala prove the advantages of enabling local people in their own efforts to rebuild after a disaster and, empowered by opportunity, women can lead a cleaner, more resilient energy future. Empower Generation is a social enterprise operating in Nepal since 2011 that starts and supports women-led businesses distributing clean energy solutions. Chanchala and Kala continue to lead a project distributing donated lights, chargers and water filters, in coordinated response as part of the larger solar relief effort.